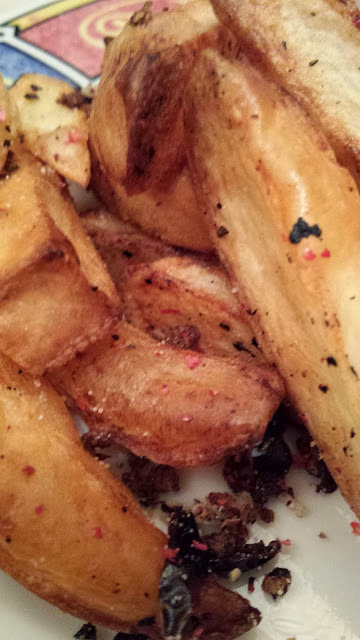 If you know anybody who attends Slimming World I can guarantee you will have heard of Syn free chips. If you haven't the idea is to make chips that avoid using allotted "Syns". When you follow the Slimming World plan you are given 15 Syns per day. Different things have different levels of Syns. I know a few people who are in a Slimming World Group and these clever little slimmers have figured out that there are about 20 calories per Syn (this is only a guess based on what level of Syns there are in certain foods). That's 300 calories of naughtiness....yay! Or not yay if you want to have a plate of chips seeing as chips are usually deep fried and have about a gazillion calories in them (a gazillion maybe an exaggeration.......maybe 450...ish). That's all of your Syns for the day gone and from what I understand you need to have spare Syns for things like bread.....because bread counts as a Syn. Anyway, moving away from the overly complicated Slimming World concept and back onto "Syn Free" chips. 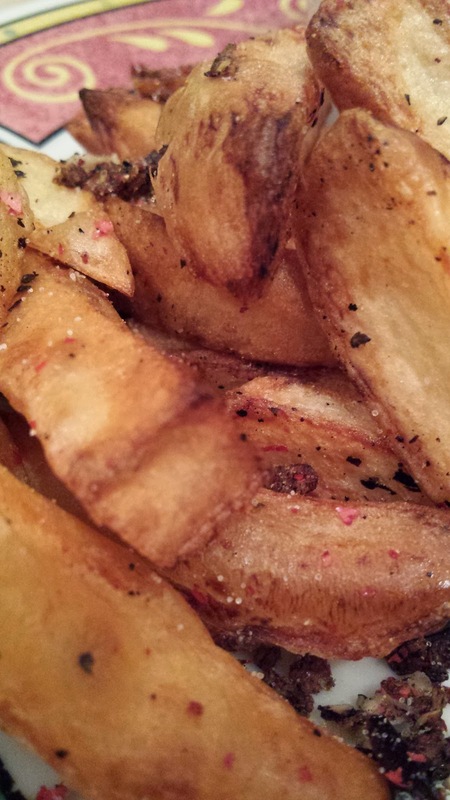 Ultimately chips are only really bad because they are deep fried. But if you bake them they are just cooked potatoes. Without the oil or fat they suddenly become "Syn Free". When dealing with healthy options in my house I have to be careful....Mr M hears healthy and suddenly everything is under scrutiny, so I have come up with "Syn Free" Chinese take away inspired Salt and Pepper chips. A firm favourite in the M household. 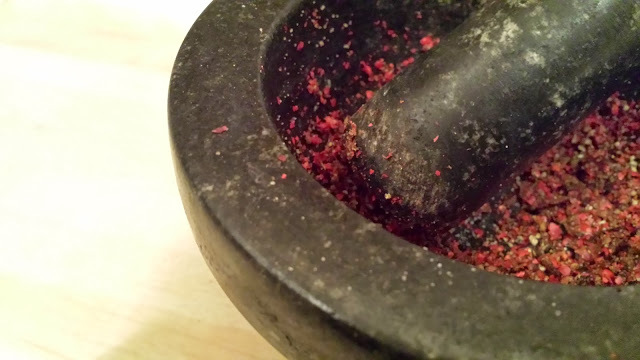 They are super tasty, super chippy, a little bit spicy, and super easy. 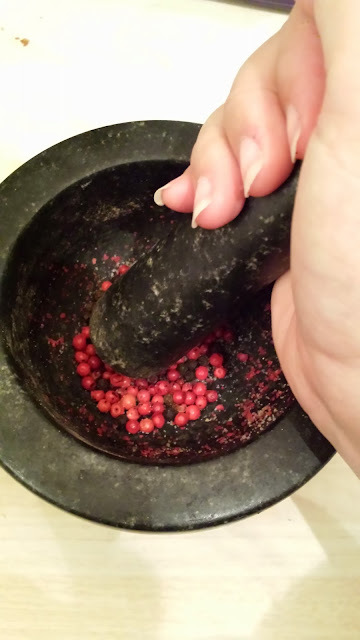 A good handful of peppercorns in the colour of your choice - although I like to use pink ones! - Peel your potatoes and chop them into chip shapes. - Pop them in a pan and part boil them for about 5 minutes, they should still be a little hard. 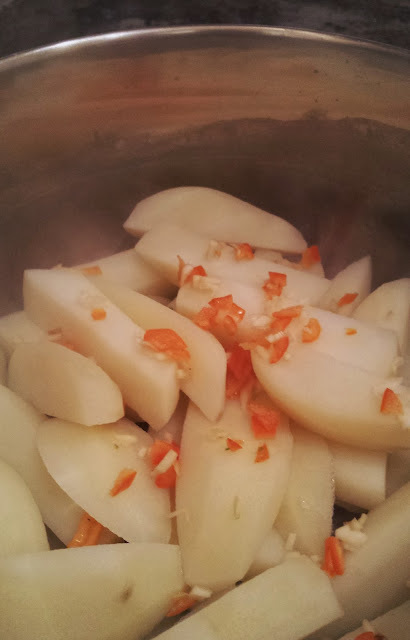 - While they are boiling finely chop your chili and garlic. 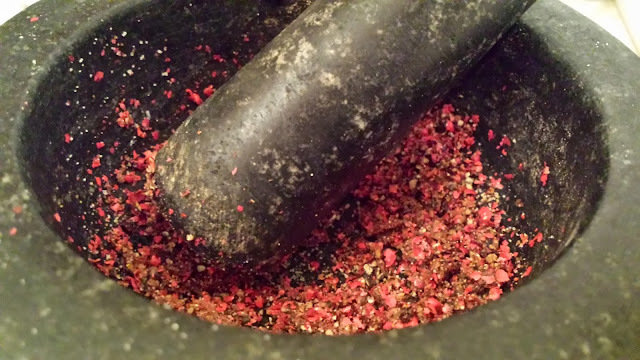 - Now take a baking tray and spray it with oil. If, like me, you don't have a spray just lightly coat it using an egg wash brush. - Spread the chips out onto the tray, give it another bum wiggle shake. 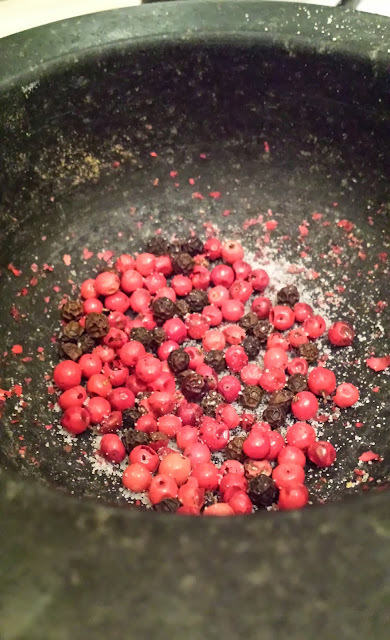 - While the chips are cooking take your peppercorns and salt and attack them with a pessel and mortar. - After the 40 to 45 minutes your wait is nearly over! 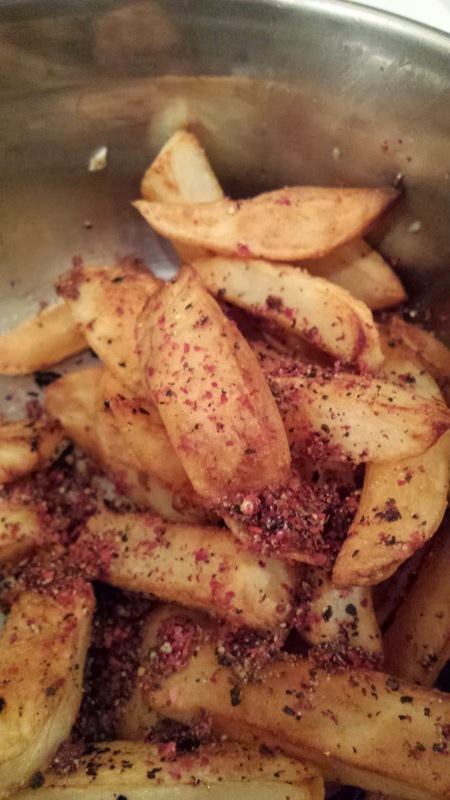 Take out your chips then sprinkle over them your pepper/salt mix. Now, all you have to do is sit back and enjoy! Of course to make them even more healthy you could use courgettes or sweet potatoes.....anything you fancy really. Give it a go and let me know what you think. Mr M liked them and asks for them all the time now....as a treat (he doesn't need to know that they are the healthy option.....sshhhhh! ).